Tonight was not the first night of Camp Meeting. It was a special service for the few that came early and helped prepare the camp for the arrival of the masses. They had a dedication service and prayer meeting for the Camp Meeting that starts tomorrow night. It gave Mary and I an opportunity to tweak our equipment and make sure we are ready. I blew it on the first few minutes of the meeting tonight. I did not have the audio wired correctly and had to fix it after service started. That was kind of stressful, but praise the Lord I got it fixed and now I'm ready for tomorrow night. We arrived at the Living Waters Youth Camp about 2:00 this afternoon. They put us in a super nice little cabin next to the gym where we will be having a Camp Meeting starting tomorrow night. The men here helped us unload our equipment and Mary and I worked until nearly 10:00 p.m. setting up in the gym. They have the gym setup with a stage and a very nice sound system. Folks are already arriving for the Camp Meeting. They fed us a very nice supper in the dinning hall tonight. We are loving it here. We attended the early service at Ben's Ford Baptist Church this morning and then took off for Birmingham, Alabama. We made it to town about 4:30 and found a nice bed at the Days Inn South where we spent the night. Tonight we found the House of Seafood and WOW was that ever a treat. I think we'll always remember the House of Seafood in Bogalusa, Louisiana. It's actually out of town about 10 miles in the country. We thought we would go early and beat the crowd. That was a mistake. We got there about 4:30 and the place was packed. We had to hunt for a place to park. I have never in my life seen so many different kinds of seafood. The even had steak and lots of vegetables. I was simply amazed. I think my favorite was fried oysters. The fried alligator was also great and the frog legs were fantastic. Mary said this was my birthday treat. Tonight we had our DVD/CD display setup in the Fellowship Hall of Ben's Ford Baptist Church. After church everybody started coming to our table to buy DVD/CD's. We ran out of several DVD's several times. I kept printing more and duplicating more. By the time the crowd deminished all the food was gone. There was lots of great food and hundreds of people to eat it. Since it was pot luck most folks had taken their dish home by the time we were ready to eat. We ended up at Burger King for a Whopper. We did not get to bed until after midnight. Ben's Ford Baptist Church in Bogalusa, Louisiana was full tonight. The singing was so wonderful and Dr. Bobby Bonner, Missionary to Zambia, Africa, preached his heart out again tonight. The Gumbo was outstanding after church. Every night the singing here at Ben's Ford Baptist Church in Bogalusa, Louisiana has been outstanding. If I can not get you listen to the preaching maybe you'll listen to some of the music. Go to SteveBrownMinistries.com and click on any of the services this week and you'll hear and see some great music. This is the second meeting where I have put a camera on the piana and I am loving it. I should have had a camera on the piana all along. I just love these shots of the the piana player and someone singing at the piana. I really enjoy these ladies everytime they sing. They always do a great job. My Sprint PDA/PocketPC/Phone has been giving me problems lately. The nearest Sprint store was over in Covington, Louisiana so Mary and I drove over there this afternoon. They said they would have to replace it and we would have to come back Thursday to pick up the new phone. Tonight we enjoyed another night of beautiful music and great preaching at Ben's Ford Baptist Church. 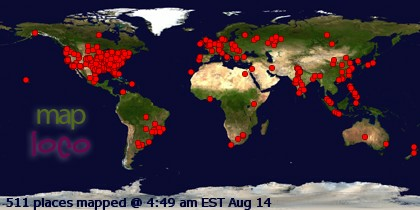 We are getting a lot of reports from around the country of people enjoying the Live Streaming Broadcast. That's encouraging. Mary and I went to the Chapel Service at Ben's Ford Christian School this morning. I have never in my life seen 450 plus kids of all ages more well behaved. They sat and listened very attentively to all the music and preaching for over an hour. It was absolutely amazing to see this many kids in this day and age actually listen to preaching for an hour. Dr. Bobby Bonner, Missionary to Zambia, Africa kept the kids spell bound. It was a wonderful message. I only regret that I was not able to capture it on DVD. Things went well for our first day in the Spring Revival at Ben's Ford Baptist Church in Bogalusa, Louisiana. The preaching was great and so was the wonderful lunch and supper at the pastor's home. At 8:00 a.m. this morning we had a loud knock on the door. The men at Ben's Ford Baptist Church was ready to go to work helping me setup our video equipment. By 2:00 p.m. I was pretty much ready for broadcast. At 3:30 p.m. Pastor Lynn Martin picked us up and took us to a 100 acre paradise for supper. One of the members of the church who is very well off financially had a sea food feast prepared. It was a mansion with a large lake and swimming pool. The swimming pool was just outside the back door where you just walk into the water. The pool was not normal in any way. It was a tropical paradise with water falls and palm trees. After supper Bro. Lynn Martin had a devotional that was fantastic. We thoroughly enjoyed our time in paradise. We had to say our goodbye's to all the folks at Happiness Hill this morning. We stopped by the new Solid Rock Boys Home and found our friends, August and Patty Rosado there visiting. So we had a opportunity to say goodbye to them before we left town and headed to Bogalusa, Louisiana. We made it to Bogalusa about 3:15 p.m. this afternoon. Some of the men from the church met us and helped unload the van. That was a huge blessing. My back has been giving me fits lately. The Happiness Hill Ministries has been buiding a new home for boys the past couple years. The just finished it recently and they have their first boy. His name is Jack. This afternoon everybody went over from the girls home to the boys home and had a dedication service. I took one of my video camera's and shoot some video of the service. I made a DVD of the service and hope to have it uploaded to SteveBrownMinistries.com in a day or so. I am very confident that the message tonight on "Being Filled with The Holy Spirit" is the best message I have ever heard in my life time on this subject. I would hope that I have it uploaded to SteveBrownMinistries.com very soon. I do not have good internet access here at Happiness Hill Girls Home in Union, Mississippi so it may be a few days before I can upload it. This is a definite "Must Watch" if you have any desire at all to be filled with the Holy Spirit. It has been a very busy day for us. The first service was at 9:30 a.m. this morning. We had lunch with the girls from Happiness Hill and then Mary and I recorded and broadcast the Ladies meeting at 2:00 p.m. I barely got things caught up from the morning and afternoon and it was time for the 7:00 p.m. service. With this schedule we're going to be very busy this week. Today is the only day this week that we will have any free time so we went with our friends from Summerset, Massachusetts, (August & Patty Rosado and August's mother) to the Red Lobster in Meridian, Mississippi. The food and fellowship were wonderful. We thoroughly enjoyed our time with them. The services tonight were just simply fantastic. Both messages were outstanding. Dr. Joseph Athyalil from India spoke first and we really enjoyed his message and then along comes Evangelist Fred Schinler and I was just in awe. If you missed it you should watch the archive on SteveBrownMinistries.com. You'll miss a special blessing if you miss it. I barely got ready in time for the Gospel Singing that started at 6:00 p.m. this evening. I quit working just long enough to eat the nice supper they prepared for us. We had to setup in the school room next to the chapel because there just was not enought room for our equipment in the chapel. That means I have to run all three cameras remotely. I really don't like doing that. I like to be in the chapel with all the other folks so we feel like we are a part of the meeting. Things went very well inspite of our handy cap. We enjoyed a couple hours of great gospel singing and put it on the internet while we recorded it on DVD and CD. We traveled from Villa Rica, Georgia to Union, Mississippi today and arrived at the Happiness Hill Girls Home. They put us in a mansion on the lake. We are staying in the master bedroom of a fabulous place. There is a horseshoe lake around three sides of the house. We are wishing we could stay here longer than a week, but we have to leave a week from today. The girls helped me unload all the equipment in the rain. The 16 girls each took an item as I handed it to them and they had me unloaded in nothing flat. I think it was the fastest I have ever unloaded. I spent a couple hours setting up after they treated us to steaks in town. I still have a lot of work to do to be ready for the Gospel Singing tomorrow night. After we left New Hope Ranch Home for Girls in Society Hill, South Carolina on our way to Happiness Hill Girls Home in Union, Mississippi we stopped off at the Camden, South Carolina Revolutionary War Site. We snapped this picture of the old Mt. Elon Baptist Church somewhere along State Highway 52 after we left Society Hill. The Kershaw House served as the headquarters for General Cornwallis during the Revoluntionary War. We spent about an hour touring the area and really enjoyed being able to go inside some of the old restored houses. Tonight was the final night of the 8th Annual Camp Meeting at the New Hope Ranch, Home for Girls in Society Hill, South Carolina. The preaching and singing was the best ever. Revival finally broke out with the girls after church tonight. The during the closing remarks and after had quit recording the video the girls began to stand up one at a time giving testimony of how our Great God had changed their lives this week and since they got saved. It was a tremendous time under the old Gospel Tent tonight. I only wish I could have captured it on video. The girls will never be the same after tonight. Praise the Lord! We enjoyed another great meeting under the big tent. Our good friend, Josh Gentle from Lexington, North Carolina blessed our hearts with a tremendous message. The Alan Sorrells Family from South Carolina was a great blessing with their songs and preaching. This afternoon while I stayed and the tent and tried to catch up on a lot of work Mary went history hunting. She took lots of pictures of old buildings. Some were built in the 1700's. She found this old church in Society Hill. The Enlightners are a couple of totally blind ladies that sing gospel songs all over the country. They have been singing together for 35 years. They have been very blessed selling their CD's and cassette tapes. They bought their own motor home and hire someone to drive them around the country and setup their motor home so they can sing. They have memorized over 2000 songs. They were a huge blessing to us and this Camp Meeting. God has used them greatly. Today we had our first two services under the big tent for the 2009 Camp Meeting here at the New Hope Ranch Home for Girls in Society Hill, South Carolina. After both services we went over to the huge girls home for lunch and supper. The best part was the peach cobbler. I should have taken a picture of it. It was great. We had no idea that this camp meeting was going to be under a big tent until we arrived last night. We spent the first half day helping to pitch the big tent then I worked until about 9:30 this evening setting up out video equipment. It was a long day. I have even aquired my first sun burn of the season. Now we're going to lose an hour tonight. I think I better get to bed. We finished our journey today to the New Hope Ranch Home for Girls just outside Society Hill, South Carolina. The girls home is fairly new and it is huge. We were assigned to one of the girls rooms. It is a small room with two little beds, a dresser and a clothes bar. We found out tonight that we are setting a huge tent for the camp meeting tomorrow. This wreck totally blocked Internet 20 west bound as we approached Atlanta, GA. The huge living room inside the Ranch House. We're off and running again. This time we're headed to Society Hill, South Carolina for the Annual Camp Meeting at New Hope Ranch Home for Girls. We made it to Lincoln, Alabama tonight. We figure that's about half way to Society Hill, SC. We met Lee and Preston in town just after Preston's ultrasound this evening. Preston has been having severe abdominal pain. We still don't know what his problem is because the doctor's are still studying the results of the ultrasound. Since we were out of town last month for Scott's Birthday we took him and Lacey out to Applebee's tonight. We had great food and fellowship. We thoroughly enjoyed our evening out with Scott and Lacey. We went to breakfast with Lee this morning at IHOP and spent most of the day helping helping him do his shopping. While we were at Sam's I spent nearly an hour walking fast and hard up and down every isle many times. I estimate that I walked between 2 and 3 miles. We made our way back home to Arkansas this afternoon. We certainly enjoyed our time with Robby, Rachael, Sophia, and Mady in Olathe, Kansas. It was also a special treat to enjoy a nice snow yesterday and then get to go off and leave it for warmer country today. The temperature was much better in Little Rock.